Produktinformationen "NViS 3542P4/3542P8, In-Vehicle Mobile NVR Surveillance System with Intel® Core™ i5/i7 Processor, 4/8"
Utilizing 32nm Intel® Core™ i7/ i5 processor, NViS 3542P series features Intel® Turbo Boost and Intel® Hyper-Threading technologies (2 cores, 4 threads), as well as on-processor graphics and two DDR3 800/ 1066 memory modules up to 8GB. In addition, NViS 3542P series provide optional 4 or 8 PoE ports which support IEEE802.3af and allows up to 16.8W maximum per port, a wide variety of display I/O configurations and rich I/O interfaces including two Intel® GbE Ethernet ports, 5 x COM ports, 6 x USB, 8 x GPIO, 2 x SATAII, 2 x eSATA, audio interfaces. 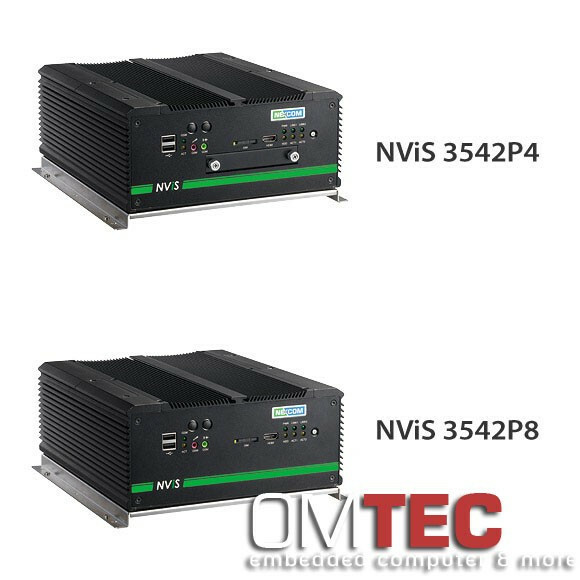 NViS 3542P is designed for a broad range of applications which demand intense graphics performance; these include medical diagnostic equipment. Weiterführende Links zu "NViS 3542P4/3542P8, In-Vehicle Mobile NVR Surveillance System with Intel® Core™ i5/i7 Processor, 4/8"